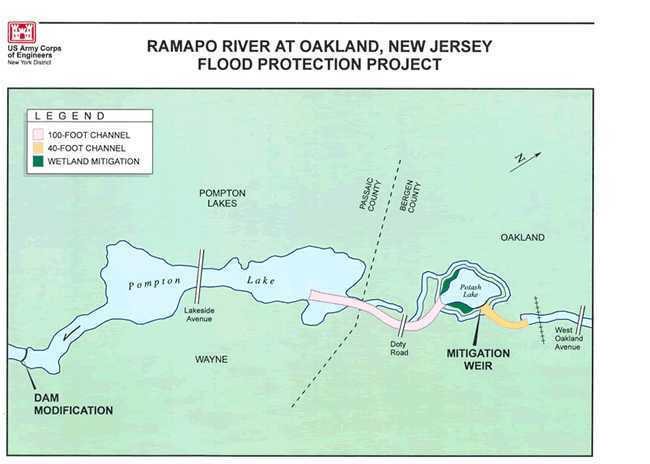 Located within Bergen and Passaic Counties, the project provides a 40-year level of flood protection to approximately 300 homes along the Ramapo River within the Borough of Oakland (Project Map). 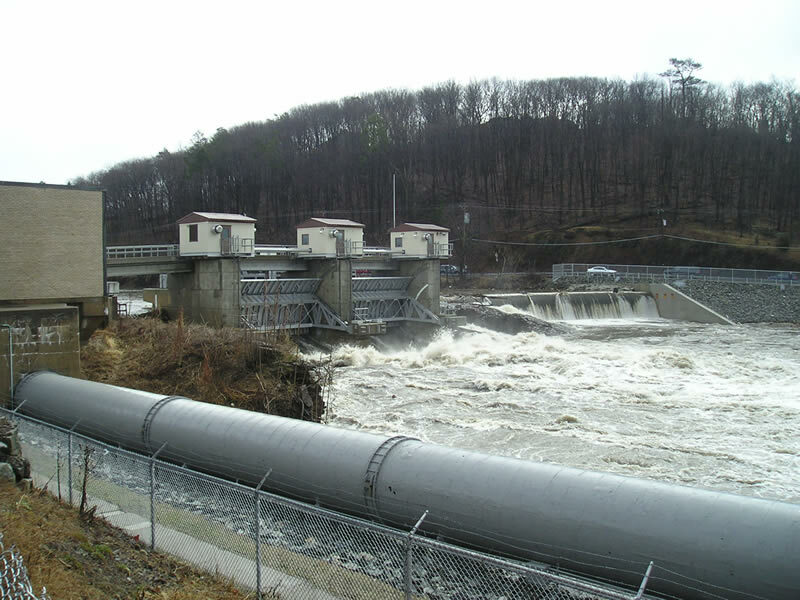 The project consisted of installing two floodgates at Pompton Lake Dam, as well as, widening and deepening approximately one-mile of the Ramapo River upstream of Pompton Lake. Mitigation for the environmental impacts of the project included the creation of an eight-acre wetland within Potash Lake in addition to restoring flow to the north and south channels that ring Potash Lake. The U.S. Army Corps of Engineers, in partnership with the Department, permitted and managed construction of the project. On August 1, 2007, under the terms of the Project Cooperation Agreement (PCA), the Department assumed all responsibility for maintaining and operating the completed floodgate facility. The North Jersey District Water Supply Commission (NJDWSC) performs operation and maintenance tasks at the floodgate facility on behalf and expense of the Department. One of the primary causes of flooding within the project area was due to water backing up behind Pompton Lake Dam during high river flow. This caused developed areas at the upper end of the lake to be flooded on a frequent basis. During the design phase of the project, it was determined that that the most efficient way to correct this problem was to replace a 90-foot section of the existing Pompton Lake Dam with a structure containing two 18-foot high by 35-foot long steel floodgates. The floodgates are designed to regulate water releases from the dam to provide flood damage reduction benefits to structures upstream of the dam, as well as, maintain the existing water supply capabilities of the lake. Regulation of water releases to prevent upstream damages is unique in that the majority of flood damage reduction dams are used to prevent downstream damages. Because of this, the operational requirements for the Pompton Lake Dam floodgates are quite different from conventional flood control structures. To provide the maximum flood reduction benefits to upstream residences, at the same time not increasing downstream flooding, a customized computer system automatically operates the floodgates in strict accordance with operating procedures developed by the Army Corps of Engineers. These operating procedures were developed to maintain the lake below an elevation that would have caused flooding within the Borough of Oakland before the project was constructed. The automated system works primarily by reading the lake level on 15-minute intervals. When the lake rises to approximately 1.5 feet above its normal level, the floodgates open 3 inches. Depending upon how quickly the lake level is rising, the floodgates will rise in concert on 3-, 6-, or 12-inch intervals. The computer will continue to read the lake level every 15-minutes and raise, lower, or maintain the gate height accordingly. After the initial floodwave has passed, the system will begin to close the gates. The length of time the gates will remain open will vary from a few hours to several days, depending upon the size of the particular flood event. During gate operations, the facility will be monitored to verify the floodgates are operating properly. If an emergency or gate malfunction arises, personnel will be available to readily respond. Should such an event occur, the gates (if no danger exists in doing do so) will be operated in a manual mode until such time that automatic gate operations can be re-initiated. The floodgates are designed to be operated in a manner that will release water from the dam at the same rate water enters the lake. In doing so, near normal pool elevations can be maintained to reduce upstream damage while not increasing flooding downstream. The project has been designed to provide flood reduction benefits within the project area against a 40-year design flood. During this event, no damages are expected to occur to the majority of the structures within the floodplain area. However, flooding within the project area will still occur along the banks and in yards near the river, albeit at lower levels than under pre-existing conditions. Flood stages during larger events will be reduced in comparison to pre-existing conditions but some damage may occur to structures. Contribution to this page include the following: U.S. Army Corps of Engineers, U.S. Army Corps of Engineers Phase II General Design Memorandum – Ramapo River at Oakland, New Jersey Flood Protection Project.